When travelling with your pet it is essential to be aware of whether your pet will be allowed onto the type of transport you are using and how you can book his place onboard. When taking a family holiday you may decide that your car is not large enough for the journey. Hiring a care for the duration of the vacation is commonplace but have you checked to see if you are able to take your pet in the hire car? When it has been confirmed that your pet is allowed to travel check to see if your pet’s cage will fit into the back of the vehicle. Perhaps that hatchback is not large enough and you will need to rent an estate car. Your pet cannot be expected to travel amongst your luggage – would a roof rack be better for the suitcases? By covering the back seat of the vehicle with an old sheet you will not have to spend time picking hair from the seat covers before returning the vehicle. Sticky tape wound around the hand is a good tip for picking up hair when a vacuum cleaner is not available. Carry wet wipes and paper towels will also be advisable for any accidents during the journey. If the vehicle should break down during the journey it may not be possible for your pet to travel in the recovery lorry. Check this detail out when booking your hire vehicle. If need be telephone the national recovery company and verify this point – getting it in writing is a good idea as quite often the drivers of the recovery vehicles are subcontractors and are not aware of the hire details. Coach companies will take well behaved pets but you must advise the company that the pet will be travelling with you. As the pet cannot travel in the luggage section and will most likely have to travel on a seat you will need to pay for this as well as taking suitable coverings to keep the area clean. Local bus companies in the UK will allow pets on board as long as they are well behaved. If the bus is a double decker the pet will have to travel upstairs. On single deck vehicles you will have to go to the back of the vehicle and keep the animal under control. You will have to pay a fare for the pet on most bus services. Be aware that some bus drivers will not let a dog onto the bus but this is their personal choice and can be disputed with the bus company. Dogs are able to travel on a train as long as they do not use a seat. They must be well behaved and on a lead. If another passenger complains about the presence of a dog the owner and dog must move to another carriage. Pets in cages are not permitted the use of a seat. For owners booking a sleeper compartment they must give 48 hours notice is a pet is to accompany them and in some instances may be charged for cleaning after use. 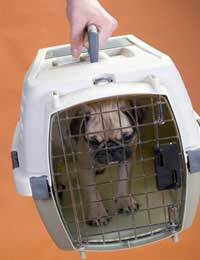 A pet can travel on a plane but must be stored in the hold in a suitable container. It is advisable to book ahead to ensure that the pet travels on the same flight as the family, although this is not always possible. Pets can travel by ferry as a passenger in the family car. Not all ferry ports allow pets to pass through so it is prudent to check before embarking on a journey. When using a pet courier company to transport your pet they will advise you of the route that your pet will travel to reach the destination. The courier company will be aware of what ports and airlines are currently accepting pets. Fabulous site just about all you need to know, however no site I found told me if it was illegal or what the laws are pertaining to dogs travelling in the front seat of cars, Do you know ? ?